Finance for $1,338 per month at 3.99% APR for 72 months with $10,280 down payment. Payment expires on 04/30/19. Estimated Finance payment based upon 3.99% APR for 72 months, with a down payment of $10,280. Excludes title, taxes, registration, and license fees. Some customers will not qualify. See your authorized dealer for complete details on this and other offers. Residency restrictions may apply. Heated Leather Seats, Moonroof, Navigation, Back-Up Camera, WHEELS: 21" FORGED ALUMINUM, CONVENIENCE PACKAGE, ALL WEATHER PACKAGE, Captains Chairs, SPORT PACKAGE. 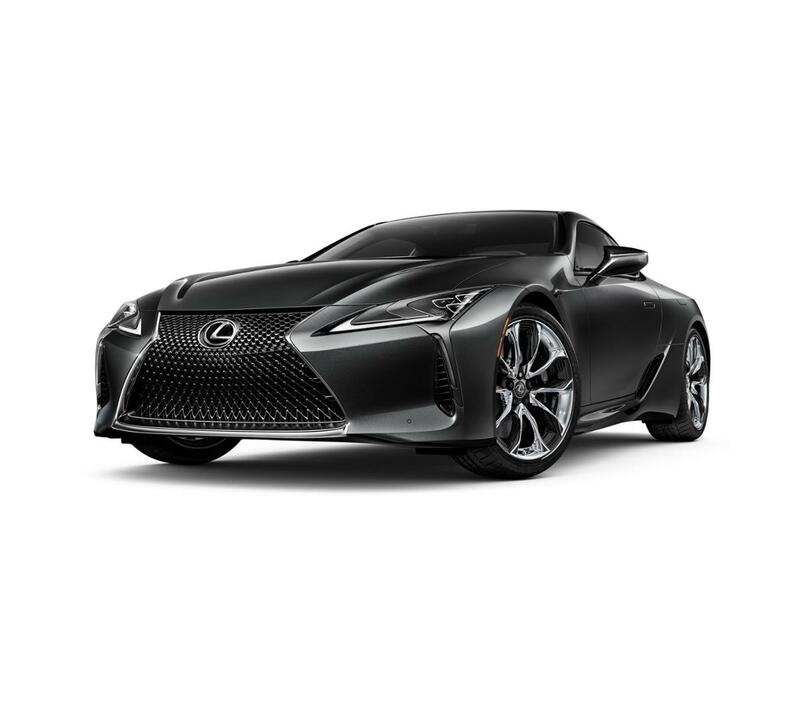 SMOKY GRANITE MICA exterior and BLACK interior, LC 500 trim CLICK NOW! WHEELS: 21" FORGED ALUMINUM Tires: P245/40RF21 Front & P275/35RF21 Rear, SPORT PACKAGE Heated & Ventilated Front Sport Bucket Seats, 10-way power driver seat, 2-way power driver and passenger lumbar support and memory for driver, RADIO: MARK LEVINSON PREMIUM SURROUND SOUND SYSTEM AM/FM tuner, DVD/CD player, 13 speakers, advanced discrete amplifier design w/835 watts max, power and 7.1-channel speaker architecture, CONVENIENCE PACKAGE Blind Spot Monitor, lane change assist and rear cross traffic assist, Front & Rear Clearance Backup Sonar, COLOR HEADS UP DISPLAY, LIMITED SLIP DIFFERENTIAL, ALL WEATHER PACKAGE Windshield De-Icer, Heated Steering Wheel, adjustable temperature settings and warmth for driver's hands regardless of grip position, ACCESSORY PACKAGE Cargo Net - Spider, Carpet Trunk Mat, Key Gloves, Alloy Wheel Locks, CARBON FIBER REAR SPOILER. Lexus LC 500 with SMOKY GRANITE MICA exterior and BLACK interior features a 8 Cylinder Engine with 471 HP at 7100 RPM*. At Lexus Santa Monica in Santa Monica, we have the new and used vehicles you have been looking for! This Smoky Granite Mica 2018 Lexus LC 500 , is available right now at your Santa Monica Lexus dealership. Call us at (424) 229-9998 if you have any questions about this Lexus or any of the other vehicles at our Santa Monica Lexus car dealership.